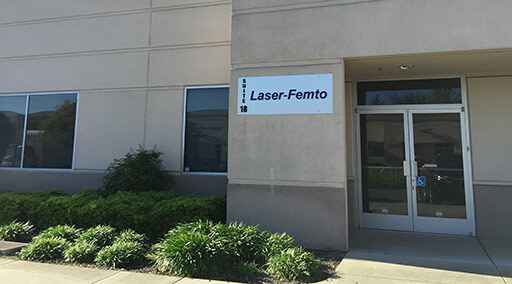 Located in the heart of Silicon Valley, Laser-Femto Inc. is a spin-off company from PolarOnyx, Inc. We specialize in engineering and production of a series of best-in-class fiber laser products, especially high power and high energy femtosecond fiber lasers. Our customers cover internationally from scientific research, industrial R&D, defense, to commercial system integrators. The mission of our company is to provide our customers with the most innovative and the best quality femtosecond fiber laser products and supports. Driven by our customer's needs and our continuous desire to advance fiber laser technology, we endeavor to deliver superior products, values and services. Laser-Femto inherits the cultures (3Ps, 4As, and 3Is) from PolarOnyx, which benefit each employee demanding a growing career opportunity. Positive attitude and open mind always come with our members towards problem solving and customer delivery and service. These cultures ensure us to continuously develop the best femtosecond fiber lasers in the world and deliver the best quality fiber laser products. Laser-Femto has received two product innovation awards at CLEO 2006 & 2007,two Prism Award Finalists (2008 & 2014), and one R&D 100 award (2013), all in high energy and high power femtosecond fiber lasers. May 2005, the first 30 mW and 100 fs SHG module at 780 nm.